Unfortunately I am a few days late again updating the photograph of the month for September (I will do my best to break this bad habit next month). I have been snowed under with email and paperwork in the office and have been otherwise head down in some reviews of some very exciting new products that are soon to be announced at Photokina in Germany. I had the opportunity to extensively field test them in Europe and Iceland in July and August and I am very impressed. I hope to have a review finished and ready to co-incide with their official announcement at Photokina later this month. 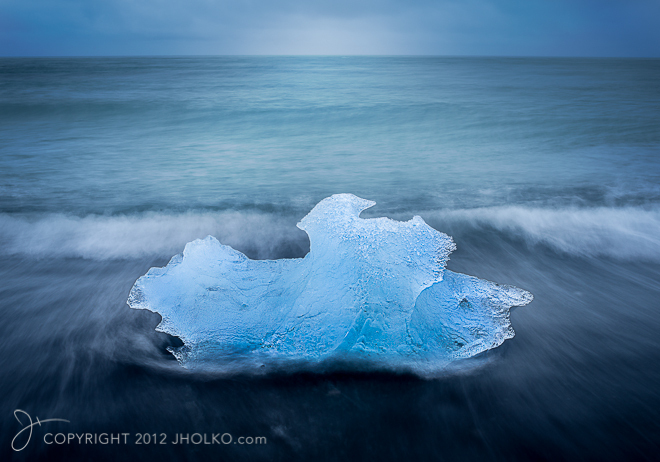 The photo of the month for September is from my recent Iceland workshop and was taken at the black sand beaches near the Jökulsárlón Glacier Lagoon around 11pm at night. This wondrous natural landscape never ceases to disappoint and is one of those amazing locations that seems to produce great photographs even when the sky isn’t exploding in a fireball of pinks and reds. Ice that carves off the Vatnajokull glacier is washed out to sea through a narrow channel where the tide then deposits it on the beach. The area is constantly changing and is never the same from day-to-day as the ice comes and goes in a myriad of shapes and sizes. This location is a personal favourite of mine and I am very much looking forward to visiting it again on my Winter workshops in March next year. Wow … that’s gorgeous!! Is this a clean edit? Can you explain more about what camera, lighting, f/stop, etc?